This Post will be very shortly described to install Linux OS over the network in which you don’t require for DVD drive and DVD images. This will help us to install 100's of servers with good scalability with less time. I appreciate you, if you asked any doubts. 1. Configure the network (NFS, FTP, HTTP) server to export the installation media. 2. Configure the files on the tftp server necessary for PXE booting. 3. Configure which hosts are allowed to boot from the PXE configuration. 4. Start the tftp service. 6. Boot the client, and start the installation. Lets take a small scenarios. I would like to install Linux OS over network via FTP without DVD (diskless installation) and Kickstart method to reduce manual input efforts like Language Selection, Disk Layout, user Creation, Network Configuration, Package Installation. If you get any ouput as vsftpd-2.0 , then vsftpd package is installed on your machine. So we can go for configuring the ftp server else you need to install the vsftpd rpm manually or using yum server. Now entire packages are available in ftp server. If you want to check that FTP is working or not. 5 check the ftp service is working or not. If the connection is established, then your ftp is working over the network. Telnet check is more than enough, if you need to verify more. Enter the url ftp://10.10.10.10/rhel5.4 in any browser from the client to ensure the directory to listing. Tftp service works under xinetd services only, so these config file will be under the directory /etc/xinetd.d/tftp. By default tftp service will be disabled. We need to enable the service. 1. Edit the file /etc/xinetd.d/tftp and make the disable = yes to disable = no . 3. Go to the default tftp directory /tftpboot which is mentioned in the file /etc/xinetd.d/tftp as server args. 4. 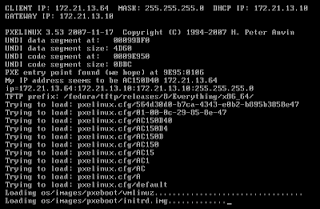 Copy the pxelinux.0 from /usr/lib/syslinux/ to the directory /tftpboot. This is the file will be run after the dhcp client accepts the dhcp ip from the server. 5. Make a directory called pxelinux.cfg under the /tftpboot. 6. Get into the directory /tftpboot/pxelinux.cfg and create a file called default. Edit the file default and append the below mentioned lines. Save and exit. Here you will have question about kernel and initrd line. We have not copied any files vmlinuz and initrd.img and we have not done any kickstart configuration. So will do kickstart at last. Now will copy the vmlinux and initrd.img files to boot the pxe client machines..
7. Make a directory RHEL5.4 under /tftpboot. 8. Copy the vmlinuz and initrd.img files from folder images which is under the DVD folder into the folder /tftpboot/RHEL5.4. In our setup, we have copied the dvd content to /var/ftp/rhel5.4. dhcp else install the rpm and start the service. 3. Edit the config file. Change the required values and comment the arguments if you don’t want and append the below mentioned lines. This will be next step from client after the ip assigned to client from dhcp. You have configured for network installation using pxe client not for automated installation which means diskless configurations. For automated installations including diskless configurations, you need kickstart configuration. For this, run the command system-config-kickstart and give the necessary settings and values. save it in the directory ks under /var/ftp/ks as ks.cfg. By this your ks.cfg file also available over ftp. Over. Now power on your client and set your first boot device as your network card.